Julius Caesar. 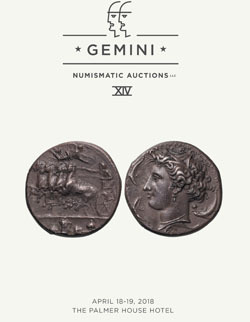 Denarius, 3.96gg. (7h). 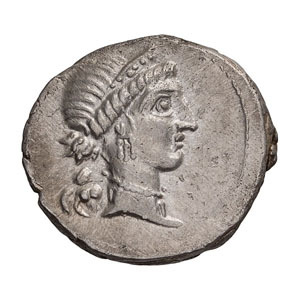 , 46-45 BC. Obv: Bust of Venus right wearing stephane, Cupid on shoulder. 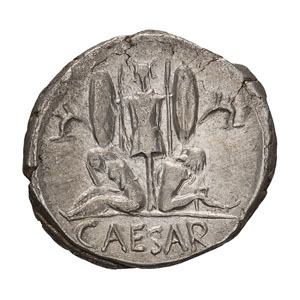 Rx: Trophy of arms including two curved trumpets, between seated female captive on left and seated male captive on right, the female mourning, the male with hands tied behind back; in exergue, CAESAR. Crawford 468/1. Sydenham 1014. Cohen 13 (2 Fr.). Sear, Imperators 58. Mint State.